Below are some window covering ideas, enjoy! for more information feel free to call us (630) 420-0800. An Idea for a patio door with shutters and stationary side panels. Watch the video below, and let us know, which style you like best? Draperies or Valances? What is your preference? French country style treatments for your windows! Enjoy the video! Call (630)420-0800 for all your interior design, custom draperies, and custom bedding! Have you considered the warmth, simplicity and elegance of a Roman Shade? Now Roman Shades come cordless! This is a wonderful feature foe child and pet safty! Take advantage of our sale for the month of January and save 25% off the cordless feature! Call Susan Gailani ( 630)420-0800. 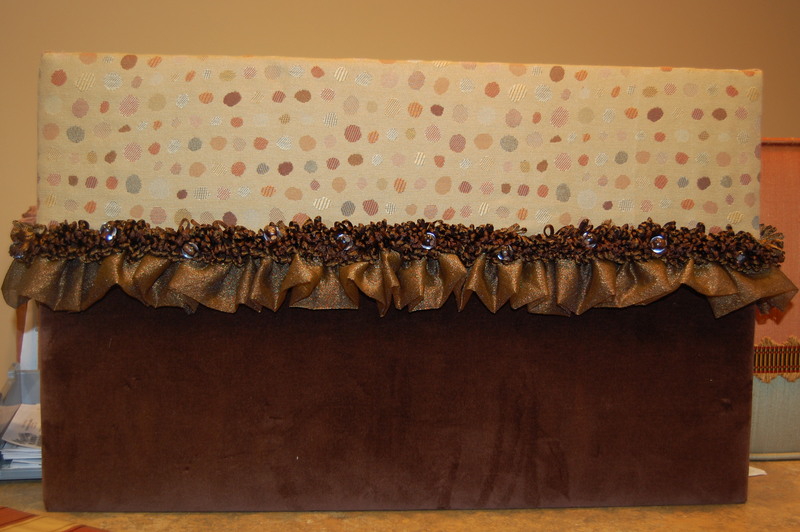 Add Interest to your custom cornices! I have noticed that most of the houses I visit that have cornices are very ordinary and even sometimes boring! Vary the textures, add various fabrics. Add unusual trims and embellishments such as trims with beads, feathers, shells, crystals, or unique tassels. Do you have arches in your room and you like to emphasis this architectural feature? Have the lower edge of your cornice to follow the arches! Your guests will notice. Add buttons, metal nails and tassels. How about adding ruffles, banding or pleats. These were my ideas! How about your ideas, would you like to share? Please call us for any questions or inquiry (630) 420-0800. A Door County Look for a Naperville home! My client expressed her desire to create a Door County style for her guest bedroom! Casual fabrics, various cotton checks. Off white canvas for an upholstered headboard. Pillows for cozy warmth and comfort. A brilliant window covering idea for a Chicago condo! An installation was successfully preformed for a Chicago Condo. My client needed draperies for the children bedrooms and the master bed room. Since the windows are ceiling to floor, as wide as the wall and the cost to cover them is enormous. One idea we came up with, since the style is very modern, that is to use black out lining only, that will insulate, cut the light, lower the cost, and the ripple fold style will give minimum stack back for maximum exposure of the view, how brilliant is that!